It seems the three big news sites in my aggregator - Slashdot, OSNews, and Digg - have all picked up this Wired story about Firefox. Apparently people are starting to complain that the Fox has gotten slow and bloated. I guess they haven't been paying attention. As an Opera user, this is something of a sore spot for me. First, the contention that Firefox is getting slow is complete and utter BS. "Getting" is irrelevant. Firefox has always been slow. Granted, speed is relative, and while FF may be fast compared to plain-old Mozilla (now known as SeaMonkey), Opera has always been way faster than both of them. If you don't believe me, try running Opera and Firefox side by side on a Linux box with a 500HMz processor and less than 256MB of RAM. The difference is painfully obvious. And speaking of RAM, Opera has always had a lower base memory footprint than Firefox. As an example, here's a quick, highly unscientific screenshot comparison of memory usage in Opera 9.20 and Firefox 2.0.0.3 running on Windows XP. Note that Firefox has 9 extensions enabled and 6 tabs loaded. Opera, on the other hand, has 24 tabs loaded. The really interesting thing to note here is that Opera's memory usage is quite variable. The 22MB in the screenshot is when Opera is sitting minimized in the task bar. Once I maximize it and start browsing, the numbers go up. In fact, the memory usage got up to 120MB at one point, but as soon as I minimize the browser window, it drops back down to 20MB or so, presumably transferring the data to disk cache. When I bring the browser window back up and start switching between open tabs, the RAM usage slowly creeps back up. So Opera is actually quite smart about memory. Not so with Firefox - its memory usage remained static when I tried the same thing. 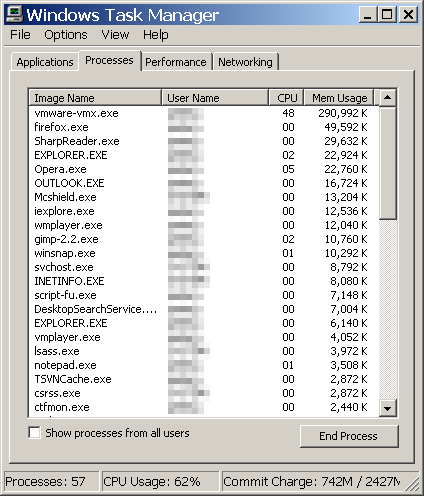 Of course, Firefox would probably have a significantly lower memory footprint with no extensions enabled. But then, what would be the point of using it? After all, extensions are one of the big selling points. It's also where most of the cool features are implemented. Enter the product of 25 and 9.